The Kids Helping Kids Foundation has slowly been building momentum in the community and beyond. We have been fortunate to support youth and their charities in some very creative fundraising efforts. The Cassie and Friends organization were part of the Scotia Bank Charity Event held on June 25th in Stanley Park. 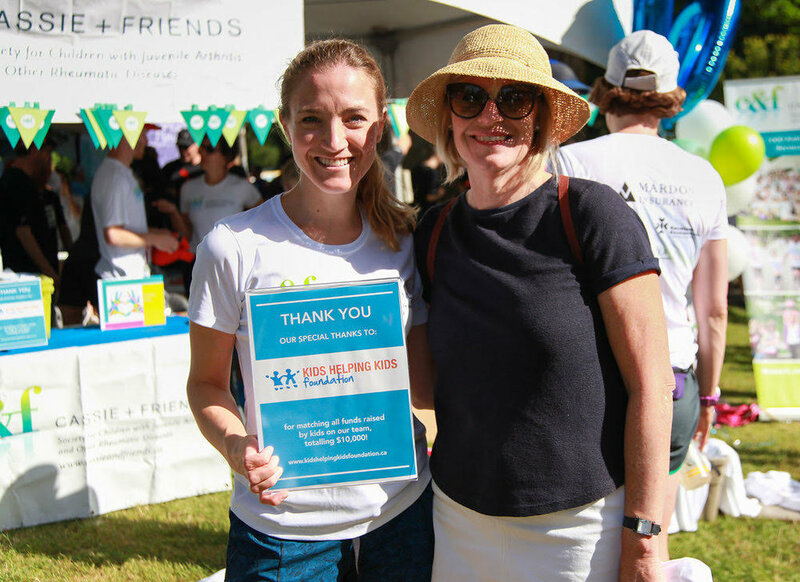 Children participated in the run and numerous other fundraising activities throughout the year to raise money for juvenile arthritis and other rheumatic diseases. In total, $24,353.00 was raised and KHK matched $10,000 of the raised funds. In support of “Backpack Buddies”, student ambassador Sebastian gained the support of his classmates to assist in raising funds in weekly school snack sales to raise money to support the Backpack Buddy program. “Need for Speed”, a fundraiser led by Cody, a 13 year old student of Mount Sleese Middle School, was in response to a challenge by his grade 6 class to make a contribution to a community project. Cody gained support in the form of donations sponsoring him on a 10K run. With the successful completion of the run Cody raised $750.00 which was matched and donated to Zajac Ranch. Pre-school children at CEFA Learning Center in North Vancouver participated in creating art for auction which benefited Ronald MacDonald House, $300.00. Southlands Country Fair Midway Games Challenge to benefit the Alderwood Family Development Center of Vancouver. $1540.00 was matched to fund the therapeutic riding program. Students from Mulgrave School hosted a “Spirit Week” where money was raised during one week of various fundraising activities that included bake sales, silent auction and car washes. All money raised benefited the Not for Sale Campaign. $6000.00 was matched. A fundraiser to benefit Youth Education Farms held at the historic Birks building raised money through ticket sales and silent and live auction. Volunteer youth included students from West Point Grey Academy. $2000.00 was matched. Students from Terry Fox High School raised funds to benefit Make a Wish foundation. $5000.00 was matched. Southlands Country Fair MidwaSouthlands Country Fair Midway Games Challenge to benefit the Alderwood Family Development Center of Vancouver. $1146.00 was matched to fund the therapeutic riding program. “Diggin the Roots” a multi cultural showcase and fashion show involving students from LA Matheson school to benefit B.C. Children’s Hospital. $4400.00 was matched. A Make A Wish Foundation fundraiser took place in May 2010. $4000.00 was matched. Southlands Country Fair Midway Games Challenge to benefit the Alderwood Family Development Center of Vancouver. $1813.00 was matched to fund the therapeutic riding program. Fundraiser by Harold Bishop School to raise money for Imagine One Day, a Canadian Charity that helps to educate children in Ethiopia. $3000.00 matching funds. Balding for Dollars Campaign, in support of Childhood Cancer. $2000.00 was matched to benefit the BC Children’s Hospital Foundation. Build a School Project, benefited the charity Imagine One Day. Students from a Surrey, B.C. elementary school took on a year long initiative to help build a school in Ethiopia. Fundraisers included a coin drive, candy grams, movie nights, raffles and a most successful and unique Water Walk. The children raised $3000.00 before matching. Southlands Country Fair Midway Games Challenge to benefit the Alderwood Family Development Center of Vancouver. Youth from the local community joined together to organize and operate the midway games at the annual Southlands Country Fair. All proceeds from the games benefit a therapeutic riding program that operates in the Southlands neighborhood. Raising $1801.00 in this first year, this event is now an annual fundraiser. Urban Aid Concert #2 to benefit Covenant House of Vancouver was another successful concert event featuring local bands and raising $1585.00 before matching. Urban Aid Concert to benefit Covenant House of Vancouver was a musical extravaganza showcasing three very talented local bands. This evening event drew 150 students and raised $2717.00 before matching.